This organ is one of the finest pipe-organ in the Maltese Islands. Built by the Italian firm Mascioni in 1960, in collaboration with organ consultant Ralph Downes, it is not just the largest pipe-organ in the Maltese Islands, but it is reknowned for its particular timbre and tonal character. Yet its value is not limited to its tonal assets - the construction and mechanisms of the organ are a work of art in themselves, and were all handcrafted by Mascioni. The organ has 3 manuals and pedals and its 33 stops speak from 4 distinct locations - the Great, Pedal and Positiv are located in the two historic organ cases, a 'choir' section is located behind the main altar, and the Swell is behind the choir stalls on the right side of the main altar. The organ was overhauled by the Mascioni firm in collaboration with Ing. Robert Buhagiar in 2011. All the original mechanisms of the organ were retained and restored. St. John's Co-Cathedral was commissioned in 1572 by Jean de la Cassière, Grand Master of the Order of St. John.] It was initially named, in the Italian common language of the time, as Chiesa Conventuale di San Giovanni Battista. 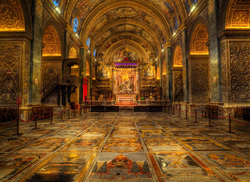 The church was designed by the Maltese architect Girolamo Cassar, who was also responsible for the construction of many important buildings in Valletta. It is held that Cassar went to Rhodes to bring a plan of an already existing church with the exact role of St. John's, that was by then converted to a Mosque, to use it as a model for the present Con-Cathedral. However Cassar still took decisions over the final design and made modifications, and thus being the sole architect of the Con-Cathedral. Once St. John's was completed in 1577, it became the new conventual church of the Order instead of St. Lawrence's Church in the Order's former headquarters Birgu. Construction of the oratory and sacristy began in 1598, during the magistracy of Martin Garzez, and they were completed by Grand Master Alof de Wignacourt in 1604. For the first century of its existence, the church's interior was modestly decorated. However, in the 1660s, Grand Master Raphael Cotoner ordered the redecoration of the interior so as to rival the churches of Rome. Calabrian artist Mattia Preti was in charge of the embellishment, and effectively completely transformed the interior in the Baroque style. In 1748, Grand Master António Manoel de Vilhena built annexes on the side of the cathedral.